Thanks to Andreas Mershin, a research scientist in the MIT Center for Bits and Atoms, there’s exciting news on the horizon for the realm of solar energy: building upon the previous research of Shuguang Zhang, a principal research scientist and associate director at MIT’s Center for Biomedical Engineering, Mershin has built solar panels from an unlikely source—agricultural waste, such as cut grass. The process, which Mershin deems as simple as taking chemicals, mixing them “with anything green” and then painting that combination on the roof, has powerful ramifications, especially for developing countries, where power is harder to come by. And because it relies on unwanted materials such as grass clippings or dead leaves, it has potential to be extremely cost-effective. While the original system required expensive, sophisticated materials and equipment, Mershin’s version is revolutionary in that “virtually any lab could replicate it—including college or even high school science labs,” says an article published by MIT. What’s more, the new version is more effective—as much as 10,000 times more effective—which is an excellent step in the right direction for solar power. Mershin says, however, that it still has a little ways to go before becoming most useful. Can you imagine that? Your own solar panels made from the grass in your front yard? 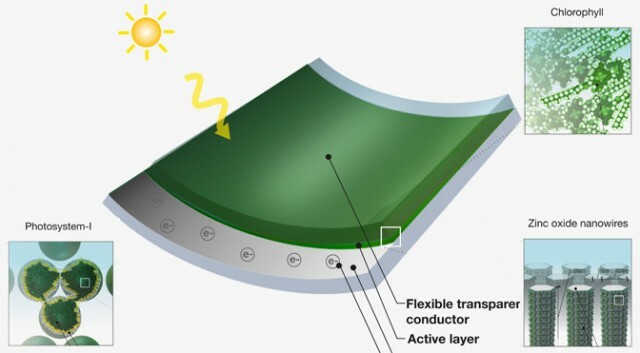 To learn more about these developments from MIT, see their news release, “Harnessing nature’s solar cells” at MIT.edu. © 2012 Up On The Roof. The content in this blog does not reflect the opinions of SoluxeSolar, its employees or investors.